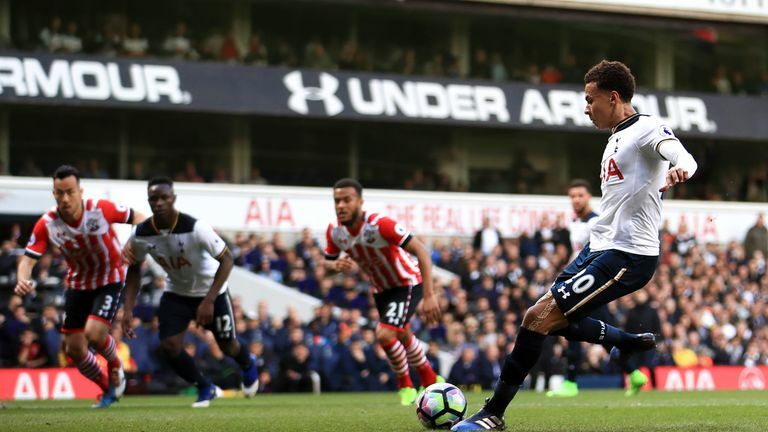 Tottenham maintained their unbeaten home record in the Premier League with a tight 2-1 victory against Southampton on Sunday afternoon. 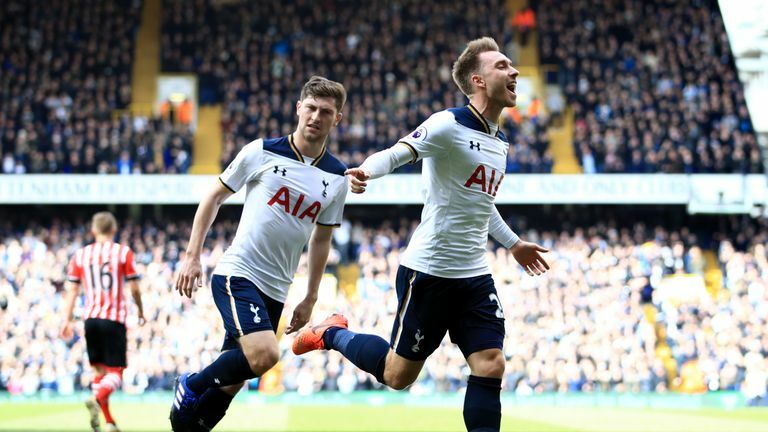 Mauricio Pochettino’s men made it ten consecutive wins at White Hart Lane in the league – 15 without loss overall – with Christian Eriksen giving the hosts the lead inside 15 minutes with a fine strike. Dele Alli was fouled by Steven Davis in the box just after the half an hour mark to gift Spurs a penalty which was converted by the midfielder, before James Ward-Prowse sealed his maiden England first-team call-up with the Saints’ reply in the 52nd minute. But despite an ultimately even match-up, it was Tottenham who held out to take the spoils, now ten points behind Chelsea at the top of the table while Southampton remain in tenth place on 33 points. 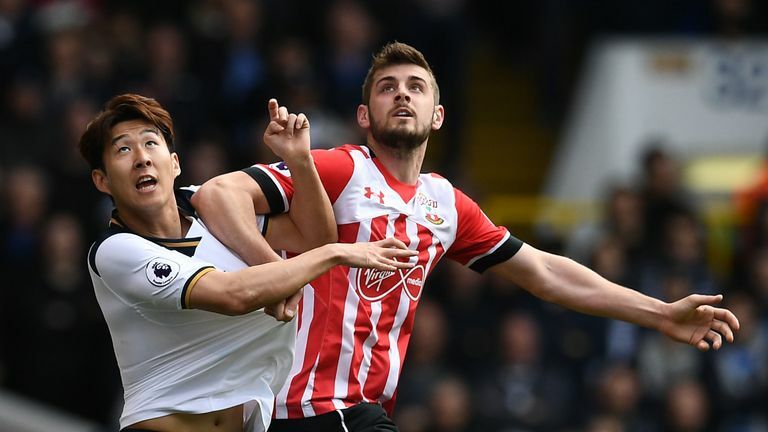 The Saints named an unchanged side for the fourth game in a row, while Heung-Min Son was chosen to replace the injured Harry Kane in just one change for Tottenham from their last Premier League outing. He was soon testing the Southampton defence as Eriksen picked him out inside four minutes with a ball over the top, but Fraser Forster was there to keep out his shot at the near post. Ten minutes later, and Spurs got their opening goal as Mousa Dembele slid the ball to the feet of Eriksen in the middle of the park, bursting past three Southampton players before taking aim from just outside the box to see the ball fly into the back of the net and put the hosts ahead. It could have been two for the hosts on the 25 minute mark as Forster got down low to palm away a Toby Alderweireld header, but Southampton also had good chances of their own. 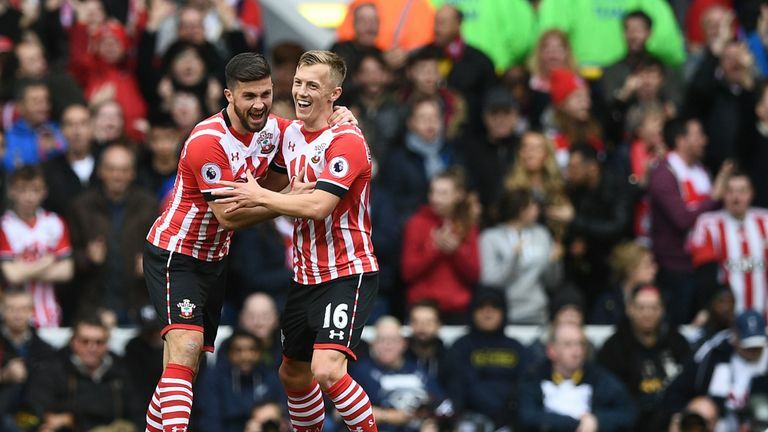 Not long after, Manolo Gabbiadini rocketed an effort just past the back post, rippling the net, before Dusan Tadic fired over the crossbar from the six-yard box as the Saints looked for an equaliser. Gabbiadini was forced off with an injury just after the half an hour mark, with Alli fouled in the box by Davis just before Shane Long’s introduction to hand Spurs a penalty. In the absence of Kane, it was Alli himself who stepped up in the 33rd minute, sending Forster the wrong way to net his 11th goal in 12 Premier League games. 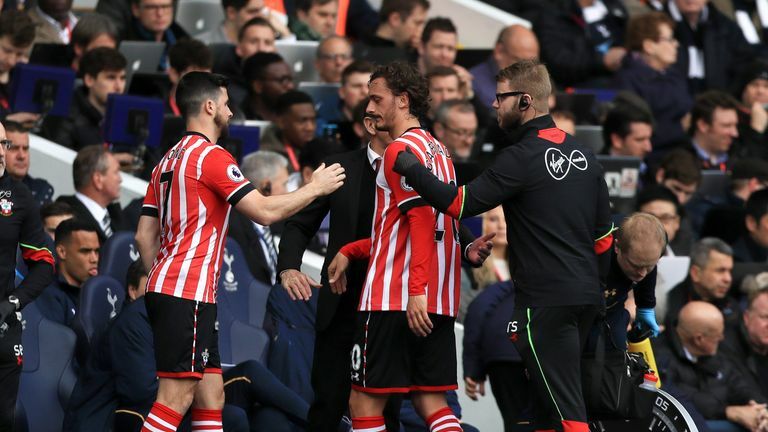 But Southampton headed into the break feeling aggrieved that they were not awarded a penalty of their own in added time as Tadic was clipped by Ben Davies in the box, but despite the Saints man needing medical attention, referee Andre Marriner did not point to the spot as they ended the half 2-0 behind. The visitors wasted little time in getting themselves back in the tie though and equalised seven minutes after the restart. It was an unusual defensive mistake from Alderweireld as he failed to clear a Bertrand pass from the left flank, allowing Ward-Prowse to control it on his chest before slotting home. Spurs could have hit back immediately afterwards as Eriksen pulled the ball back into the box for Son, but the South Korea international could only fire high and wide over the crossbar from point-blank range. The remainder of the second half offered little in terms of attacking chances with the two sides evenly matched despite the scoreline, although the frantic final minutes of the match offered the opportunity for more goals. Alli was denied a second penalty of the afternoon after being clipped by Oriel Romeu in the box as the clock ticked towards the 90 minute mark before Forster pulled off a stunning leaping save to keep out a thunderbolt effort from Vincent Janssen. Sofiane Boufal could have been the hero for the Saints in the second of five minutes added on, but his curling shot just whistled past the upright as Tottenham saw out a tight encounter.